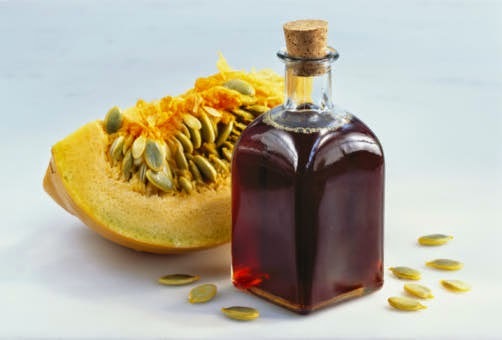 Pumpkin seed oil or PSO is extracted from the seeds of a wide variety of pumpkins through cold-pressed method, super-critical fluid extraction method or solvent extraction method. In countries like Austria, Croatia, Slovenia, Hungary, Romania, etc., the oil is taken out from the roasted seeds of a certain local species of pumpkin by following the traditional method. Typically, pumpkin seed oil is very thick in consistency and turbid in nature. Hence, it needs additional filtration before use to reduce its turbidity. The oil also has a rare property of dichromatism due to which it shows two prominently different colors in a single sample. It looks dark bright green in thin layer while thick layer of the oil looks deep clear red. In general, pumpkin seed oil is blackish green in color, which is mix of both the aforementioned colors. Being rich in healthy nutrients, such as vitamins, minerals, essential fatty acids, etc., this oil offers tons of benefits for our health, skin and even hair. Pumpkin seed oil is a storehouse of potent antioxidants that battle free radicals throughout our body. It mainly contains lots of vitamin E, which protects our skin cells from oxidative damages through its excellent antioxidant properties, thereby giving us young and beautiful appearance. The oil comes packed with vitamins, minerals and essential fatty acids, which also contribute to its anti-aging capacities. It’s a complete no-brainer that an oil loaded with so many vital nutrients can make our skin nourished and healthy. The vitamins like A, E and K; minerals like iron and zinc, and good fats like omega-3 fatty acid and omega-6 fatty acid, etc. 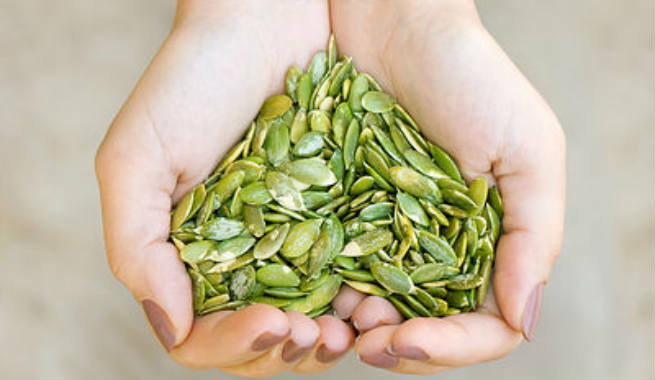 present in pumpkin seed oil offer a host of skin benefits including deep nourishment. Therefore, it is considered as a super-food for our skin. From sheer hydration to long-lasting moisturization, pumpkin seed oil can give all to your skin. As said previously, it is rich in essential polyunsaturated fatty acids, which go deep into the skin and help in retaining its natural moisture. They are also quite helpful in regulating our skin oil in perfect manner. Result? No more dry or oily skin. Just an ideal skin with perfect oil balance. That’s it! Pumpkin seed oil has remarkable skin toning capacity, which helps in averting premature sagging as well as increases the firmness of skin to a great extent. It is enriched with antioxidant vitamin C and micro-nutrient mineral zinc, both of which are effective in maintaining the natural levels of collagen in our skin. As a result, the normal structure of our skin cells remains intact and our face look firmer and more toned naturally. There are very few natural ingredients that can promote our cell turnover as efficiently as pumpkin seed oil does. Evidences show that the oil contains natural alpha hydroxyl acids, which give us radiant and youthful look by facilitating exfoliation and encouraging cell regeneration. Other nutrients like polyunsaturated fatty acids, vitamin E and zinc also make it an excellent solution for premature aging, dehydrated skin and cell renewal. An oil and breakout prevention can never go hand in hand. Well, with pumpkin seed oil, it can, definitely. Thanks to two micro-nutrients zinc and selenium present in it, which are capable of fighting acne as well as other breakouts, thereby giving us clean and clear complexion. Apart from keeping breakouts away, pumpkin seed oil also helps in fading away acne scars with its high vitamin E content. 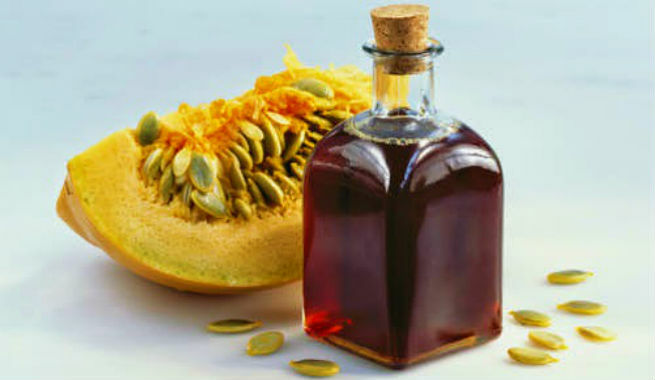 According to experts, pumpkin seed oil holds amazing anti-inflammatory properties. Hence, you can get rid of all your skin-related issues like redness, itching, irritation, inflammation, etc. by embracing this simple natural oil. The vitamins, minerals, essential fatty acids, and antioxidants present in it not only calm and soothe sensitive skin, but also treat eczema and rashes successfully. Do you want a totally enviable skin? Pumpkin oil can be the perfect answer. Being loaded with vitamin A, vitamin E and zinc, it impacts our skin tone in an excellent way. Regular application of the oil can enhance your actual skin tone visibly. That’s all folks. You definitely need to use pumpkin oil onto your skin to experience brilliant results. Just try it!